My last post was about the macrophylla varieties of hydrangeas growing in my yard. Those have big, rounded blooms and large leaves. 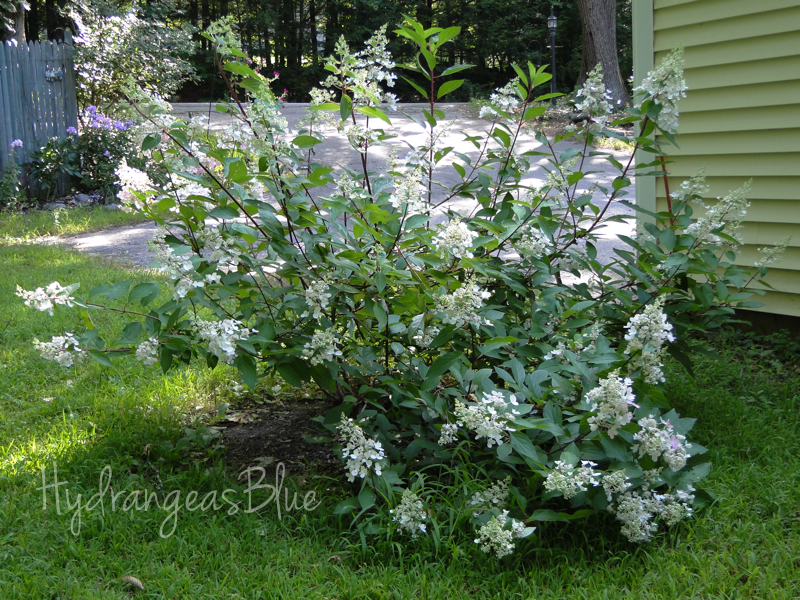 This post contains pictures of my two types of paniculatas, which are hydrangeas with elongated type flowers. In general I have found the paniculatas to be very easy to care for. They seldom droop in a drought, as the macrophyllas (Blushing Bride and Endless Summer) wilt quite easily in hot sun, and when they are dry. 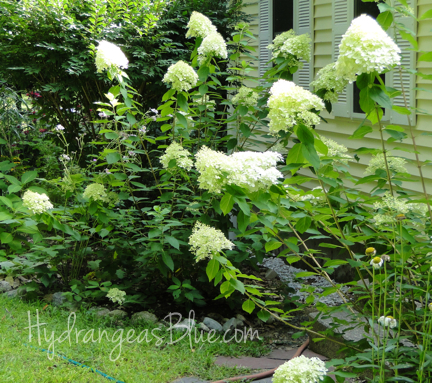 The first photo is of the Limelight hydrangea. It was taken in August 2015, and as you can see it is not flowering, but it does have buds. The second photo is from last year at approximately the same time. As you can see, this year I will not get the blooms like last year. Again, I blame this on our incredibly horrible winter. The extreme cold and piles of snow have done a number on just about everything in my yard. 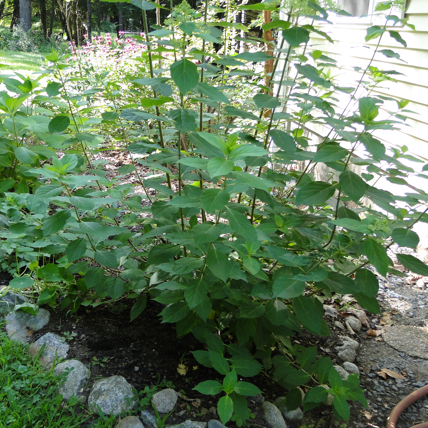 Some of my Hostas never grew back, and the perennials I thought had died, are still living, but they are way behind on growth, like the hydrangeas. The last picture I have is of the Pinky Winky hydrangea. 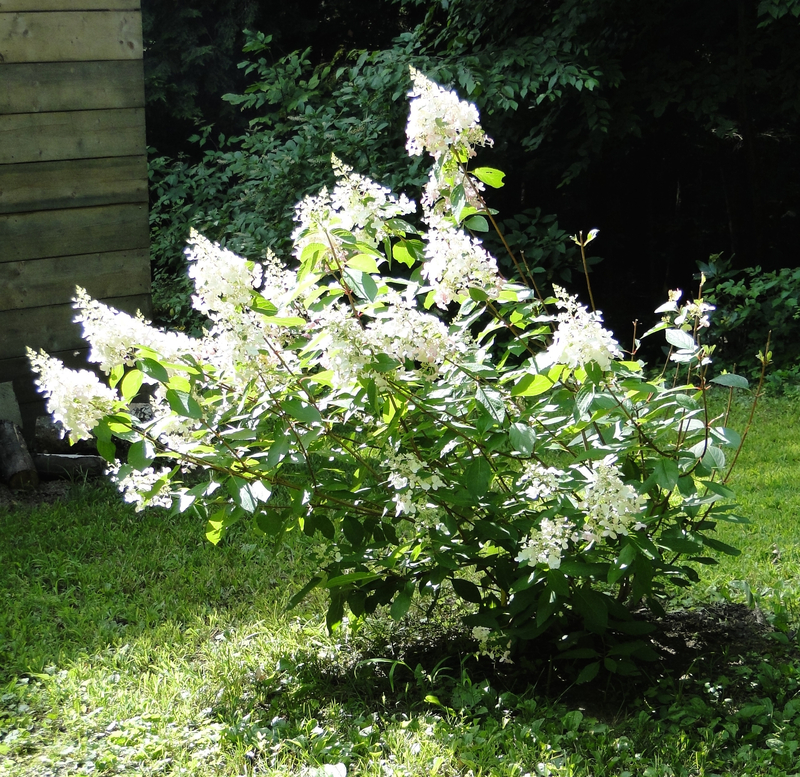 I have come to love this plant for it’s beautiful, long-lasting blooms. It is also a very easy plant to grow. Plant it and forget it. Unfortunately, I could have chosen a better spot for this one to grow. Without a lot of yard space, I thought it would have plenty of room to expand next to the garage. Then the snow came and my plow guy pushed loads of snow over the poor thing. It came back and grew fine. This year I had to have a broken tree taken down, and as the tree-cutters brought the big beech down, the branches landed on my Pinky Winky. It was enough to break one of the main, low branches. I will have to cut it, as it’s split. I want to wait until the blooms go by. The only problem I have with this one is that the deer eat it – see how lopsided it is in the photo above? There is a big deer population around my house and they come up from the woods at the side of the house to check the yard for dinner. After they munch on my rhododendron, they chew down the stalks of the hydrangea. It’s the only hydrangea they eat, and I think it’s placed just right (or wrong). So between the broken branches and deer trimming, I may not get to see this perennial grow too large before I move, but it’s still beautiful. This is the only hydrangea that doesn’t seem to have been bothered as much by the extremely cold winter. I would love to have more Pinky Winky hydrangeas in my yard.